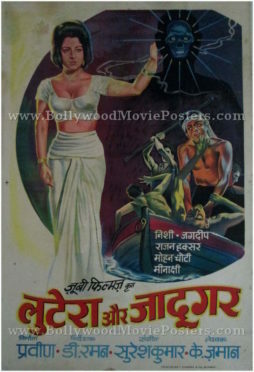 Vintage Bollywood poster for sale of the old Hindi film Lutera Aur Jadugar (1968). This is an actual surviving vintage Bollywood movie poster for sale of the 1968 Hindi film starring Azad, Jagdeep, Nishi, Tabassum, Meenakshi, Mohan Choti and Rajan Haksar. This extremely rare Bollywood poster features stunning quirky artwork, making it highly collectible! Printed and circulated during the original first release of the film (somewhere in the late 1960s), this vintage Bollywood poster was printed for publicity of the film but never ended up being used. The design of this quirky Bollywood poster features a hand painted evil skull in the backdrop, while fighting pirates are seen in the foreground. Vintage Indian poster for sale of the adventure Hindi film, Zimbo (1958). This is an actual surviving old Indian movie poster for sale of the 1958 Hindi film that was styled along the lines of Tarzan of the Apes. Noted film director Homi Wadia modeled his character “Zimbo” along the lines of the popular icon Tarzan, adding an “Indianized taste” to the adventure film. The main attraction of the film was Pedro the chimpanzee also referred to as the Ape Bomb. Called “Dada” in the film, Pedro the chimpanzee was dressed in female clothes to add humor to the film and was even trained to handle a gun in the climax. Printed and circulated subsequent to the first release run of the film (somewhere in the 1970s), this very rare old Indian movie poster was designed and printed for publicity of the film but never ended up being used. Originally designed in hand painted oil on canvas format by an art studio in Kolkata, this old Indian movie poster for sale features quirky hand drawn renditions of the lead characters of the film. The choice of colors, in particular yellow and red give the poster a stunning eye catching appearance. Lead actor Azad is seen battling a lion (taken from a key scene in the film) at the bottom of this vintage Indian poster. Pedro the chimpanzee (also referred to as the Ape Bomb) is seen in a smaller rendition at the bottom. Zimbo is a 1958 Bollywood action adventure Hindi film directed by Homi Wadia and produced by Basant Pictures. The film featured special effects by Babubhai Mistry and starred Azad, Krishna Kumari and Chitra. The film was originally made in 1937 as Toofani Tarzan minus the ape, directed by Homi Wadia and produced by Wadia Movietone. 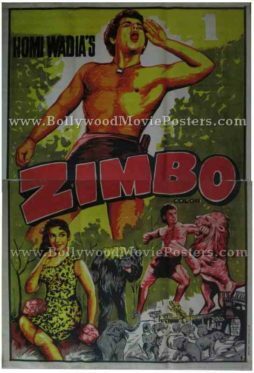 Very rare old Bollywood poster for sale of the adventure Hindi film, Zimbo (1958). This is an actual surviving old Bollywood poster for sale of the 1958 Hindi film that was styled along the lines of Tarzan of the Apes. Noted film director Homi Wadia modeled his character “Zimbo” along the lines of the popular icon Tarzan, adding an “Indianized taste” to the adventure film. Printed and circulated during the original first release run of the film in the 1950s, this very rare old Bollywood poster was designed and printed for publicity of the film but never ended up being used. 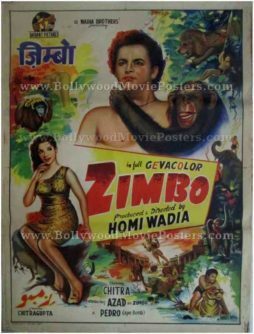 Very rare original old Bollywood movie poster of the memorable Homi Wadia Hindi film, Zimbo (1958) for sale. This is an actual surviving first release original Bollywood movie poster of the 1958 Bollywood film that was styled along the lines of Tarzan of the Apes. 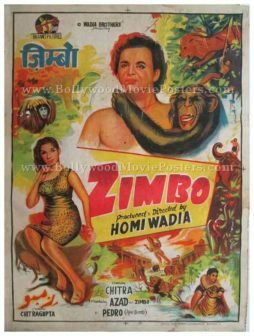 Homi Wadia modeled his character Zimbo along the lines of the popular icon Tarzan, adding an “Indianized taste” to the adventure film. Printed and circulated during the original first release run of the film in the 1950s, this rare hand painted Bollywood poster was designed and printed for publicity of the film but never ended up being used. This poster has been graded as ★ AI (As Is) due to small missing pieces as well as visible water stains seen clearly in the photograph. Please study the accompanying image carefully before making a purchase.